"Exodus" is the sign marking the exit as passengers depart a bus in Greece. It's going out, moving from one place to another. In the heart of an artist, exodus is the sign marking the exit as he discovers the freedom to create what he was meant to create all along. It's a journey of discovery, unpacking what's in his heart and soul. And when three men on the same journey pull together, Exodus emerges as real music for real life, an aggressive sound acknowledging good times and hard times, a rhythm holding fast to the promises of God. These are songs of hope and beginnings, a soundtrack for living with no regrets. Exodus is the re-birth of Plus One, pressing forward as a three-piece rock band, co-produced by Newsboys' Peter Furler and Plus One. Having survived a difficult season of change, and on the heels of co-headlining the popular Festival Con Dios tour, the group releases, Exodus, its third studio record and first for Inpop Records. Exodus reveals a journey where one travels frayed but not beaten. Containing nine songs written by the band and a gorgeous interpretation of the worshipful "Here I Am," Exodus depicts three men moving to turn uncertainty into triumph. It's about realizing change is less about exiting and entering, but more about understanding the journey, where the hidden genius is discovering God's trustworthiness. Plus One remains the best-selling, award-winning group responsible for more than 1.2 million records sold over just a couple years. Its debut record, The Promise(2000), impressively shot to gold status in just 10 months. Jet setting the country, Plus One landed on numerous national television shows, including "CBS Evening News," CNN's "World Beat" and "Entertainment Tonight." Gracing the covers of top Christian and general market print media, including The Wall Street Journal, Plus One collected, too, the 2001 New Artist of the Year Dove Award from the Gospel Music Association. Hugely successful and sailing strong on the acclaim of its second record, Obvious, the fall of 2002 found Plus One in the mist of some tough decisions. Band member Jason Perry elected to pursue different ventures. Jeremy Mhire parted a few months later to get married. The remaining trio-Nate Cole, Gabe Combs and Nathan Walters, roommates while home in Nashville-supported the moves but weren't sure how a downsized Plus One might continue. "When it first happened, we all had to take a step back and take a hard look at things," Gabe says. Then principal business posts changed for the band. Its shelf life suddenly in question, Nate, Gabe and Nathan found catharsis in writing and playing songs for each other, ones usually exploring the challenging task in front of them. "It was the most freedom in writing we'd experienced as artists," recalls Gabe. That liberty inspired them to continue the band on their own. "From the start, everything about Plus One was created for us. Other people had the vision," Nate says. "It didn't have our whole heart, so we started changing it. We were almost a fad band with a timer ticking down, and at the same time starting to see a new vision for what Plus One could be." "Fortunately, we were prepared when it did," he continues. "Nathan and Gabe grew up playing instruments in church. But it was our friendship that really kept us together. We felt God had blessed us with songs that needed to be heard." "We kept the Plus One name to embrace our past," says Nathan. "Nate says it's kinda like bad hairstyles: Look back in your yearbook. You don't hate your hairstyle, but you do laugh-the look was cool then! You're proud of it. The fact is, our early success as Plus One brought us to this place and we don't ever want to forget that." Through all the changes, there remains one absolute constant. "We still want to make music that directs people to God," says Gabe. "We want to help people sense God's love," says Nate. As a biblical theme, exodus isn't simply a story of leaving one place and arriving in another. It's the celebration of new found opportunity. It's the presence of mind to be content despite the mystery of not knowing fully your destination. "It's about calling on God, trusting Him as you cut the cord to move forward, even when facing the unexpected. It's about growing and learning through experiences," Nate says. Digging into the lyrics, you'll find words sounding as if they came from Ecclesiastes, ramshackle and fragile, ones not typically employed on a Plus One record: Failure. Fear. Afraid. Coldness. Stranger. Broken. Bare. Doubt. Murder. Aimless. Naked. "We've created a record," says Nate, "that isn't fantasy Christian world. It's got the realities of life being hard, but coming out on top. This record lets people feel a little sad so that when they go through a real battle they won't think they're crazy for feeling that way." 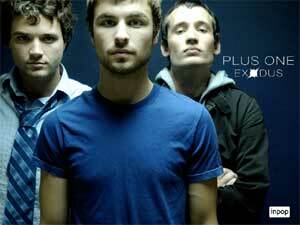 Plus One records and plays live, a logical progression, the guys explain, following last year's support of Obvious. The group, with Nate continuing his role as principal vocalist and frontman, still champions great vocal performances, and it funnels its energetic performances into gritty melodic musicianship. There are live drums and bass as the band tinkers less with digital programming, evoking a markedly edgier sound than before. "I think our live show is one of the strongest elements of the band," says Nathan. "We work really hard to make sure that it's an accurate reflection of the record. The response has been pretty amazingwe've even had a couple of guys who were ready to make fun of us tell us after seeing the show that they couldn't wait to buy the new record." As fans embrace this next chapter of Plus One's sojourn, Nate, Gabe and Nathan hope listeners embrace life's challenges as Plus One has. "We're having fun. Right now I think we're the most content we've ever been," says Nathan. "And it's all because we're living in obedience to God." "There's a lot of emotion behind these songs," says Gabe. "I hope that comes across on the record. I want people to feel the same things we felt when we were recording Exodus, joy, hope, peace, sadness, encouragement." Nate takes the last word. "This album is like its own world and listeners go there. It's a reflection of the real world we live in-there are hard times and great times. At the end of it all, we have hope in God. I want people to walk away with a greater sense of trust and faith in God." That's what the journey is all about.